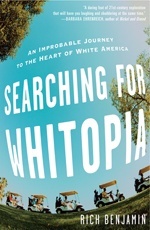 What Exactly is a Whitopia? Bill Frey, a senior fellow at the Brookings Institution, a prestigious nonpartisan think tank based in Washington, D.C., has been documenting white population loss from ethnically diverse "melting pot suburbs" for decades. And that loss is significant. During the 1990s, the suburbs of greater Los Angeles lost 381,000 whites, and other California suburbs, such as Oakland and Riverside -- San Bernardino, and also the Bergen-Passaic suburbs in New Jersey, lost more than 70,000 whites each. The rate of white population loss from the melting pot suburbs of Honolulu, Los Angeles, San Francisco, Miami, and several other major suburban areas exceeded the rate of out-migration from their central cities. To be sure, race and immigration are not the only factors pushing whites from cities and "melting pot suburbs." Whites, like Americans of all races, have felt pushed by stagnant job opportunities, pricey housing markets, congestion and traffic, crumbling public facilities and services, and neighborhoods that seem hostile to raising children. Quality-of-life and pocketbook factors matter greatly. Matthew Dowd, a founder of Vianovo, a blue-chip management and communications consulting firm with clients world-wide, who also served as chief strategist for Bush-Cheney '04, explained to me in a telephone interview that Americans don't trust the unfolding economy, regardless of who is in the White House. "Unemployment numbers, inflation rates, and all those figures don't really tell the story anymore, because people have lost some faith in all the major institutions of the country -- from churches, to political parties, to the government -- and so they have this great deal of anxiety about what they can count on." Dowd believes this anxiety has bred a longing for strong communities, though he doesn't get into the racial traits of those communities. "Part of what's happened in our society over the last twenty years," he adds, "is that people have lost their connection to each other and to the community organizations that they or their parents or their grandparents participated in. So they're looking for this sort of new community." This type of "new community" is really back-to-the-basics, placing as it does a premium on sporting, volunteerism, neighbors, friends, faith, family, and hearth. People inhabiting this "new community" are bonded by a common investment and vision. This vision matters as much as economics -- Whitopia has grown briskly during past recessions and throughout the economic roar of the late 1990s. "I wish I could go back in time," says Lynn Jensen, a middle-class mother in Livingston County, Michigan, a Whitopian ex-urb. "We had stable lives. Mom could stay at home, and we could afford it. Life was slower. God, I'm sounding like my parents -- all nostalgic for the old days. But it's true: There wasn't trouble then like there is today." "The California I grew up in was a little paradise," says Phyllis Sears, an eighty-three-year-old resident of St. George, Utah. Other St. George residents compare the dry mecca to the Southern California of decades past. The high tide of Whitopian migration typically crests at two pivotal moments in the life cycle: when residents start raising children and when they retire. Children and senior citizens face very different challenges, but both age groups are more vulnerable than young and middle-aged adults. Children and seniors particularly require physical and emotional security in their homes and communities. Hostages to the dictates of time -- the demands of the future and the spells of the past -- parents carve idealized lives for their kids, just as the elderly guard idealized memories, perhaps eager to leave their particular legacy. Thinking seriously about childhood, one's children's or one's own, whisks a potent undercurrent of nostalgia into Whitopian dreaming. Whitopian migration results from tempting pulls as much as alarming pushes. The places luring so many white Americans are revealing. The five towns posting the largest white growth rates between 2000 and 2004 -- St. George, Utah; Coeur d'Alene, Idaho; Bend, Oregon; Prescott, Arizona; and Greeley, Colorado -- were already overwhelmingly white. Certainly whiter than the places that new arrivals left behind and whiter than the country in general. We know why white folks are pushed from big cites and their inner-ring suburbs. The Whitopian pull includes economic opportunity, more house for your dollar, a yearning for the countryside, and a nostalgic charm you will soon see. Most whites are not drawn to a place explicitly because it teems with other white people. Rather, the place's very whiteness implies other perceived qualities. Americans associate a homogenous white neighborhood with higher property values, friendliness, orderliness, hospitability, cleanliness, safety, and comfort. These seemingly race-neutral qualities are subconsciously inseparable from race and class in many whites' minds. Race is often used as a proxy for those neighborhood traits. And, if a neighborhood is known to have those traits, many whites presume -- without giving it a thought -- that the neighborhood will be majority white. As much as creative elites in Manhattan and Hollywood might like to dismiss this trend as "Corn-fed racism," or to ridicule it as "boringly bourgeois," it is our present and future. Sorry, city sophisticates. Between 1990 and 2000, America's suburban periphery grew by 17 million people. By contrast, city cores grew by a fraction -- only 3 million people. In the years since, outer suburban and exurban counties have grown at triple the rate of urban counties. For all the noise over gentrification, skyscrapers, and metrosexuals, the real action is happening on the periphery: remarkable white migration, resilient economies, and significant political power. The above is an excerpt from the book Searching for Whitopia: An Improbable Journey to the Heart of White America by Rich Benjamin. The above excerpt is a digitally scanned reproduction of text from print. Although this excerpt has been proofread, occasional errors may appear due to the scanning process. Please refer to the finished book for accuracy.